Did you know the fastest climbing #1 hit record in history was “Love Grows Where My Rosemary Goes”? It was. Deemed a one-hit wonder, the song was lip-synched by The Greenfields — aka Edison Lighthouse. Music history aside, rosemary tops the charts at my house, too. 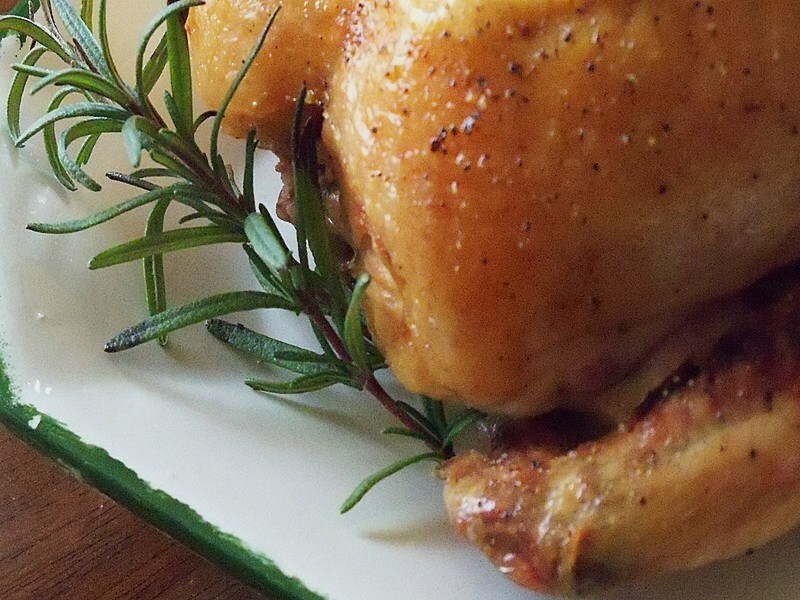 This Rosemary Garlic Roast Chicken is infused with flavor and, best of all, it’s easy peasy. Rinse chicken inside and out with cool water; drain, then pat dry with paper towels. 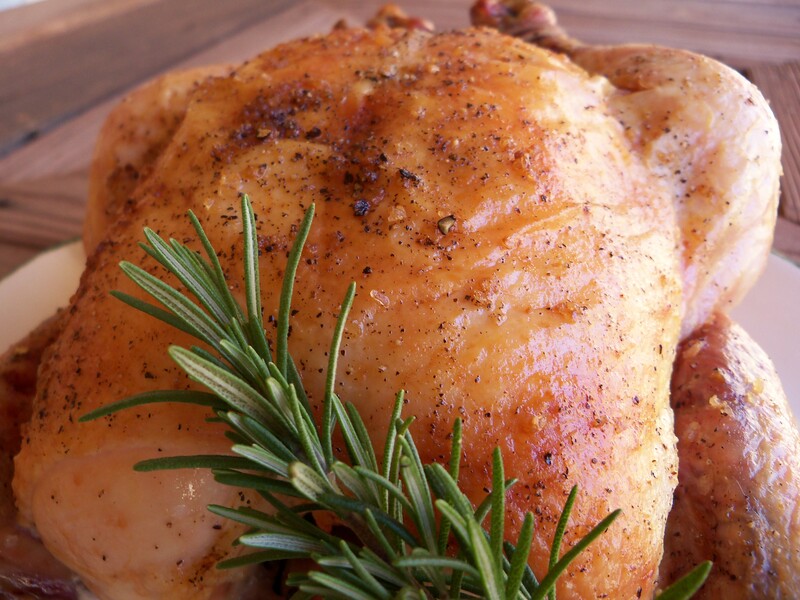 Place the chicken breast-side-up in a shallow roasting pan; rub skin with olive oil. Season liberally with salt and pepper. Insert one rosemary sprig into the chicken cavity. Cut the garlic head in half horizontally (peel & all) and insert into cavity with rosemary. Lasso the legs together :) — truss or tie the drumsticks together with kitchen twine. Roast uncovered for 2 hours (adjust roasting time as needed, depending on the size of your chicken — mine was 5 pounds) and baste once, halfway through cooking time. Remove twine; discard rosemary and garlic. Transfer chicken to a warm platter and garnish with the remaining rosemary sprig. The golden brown colour of that chook looks pretty awesome. 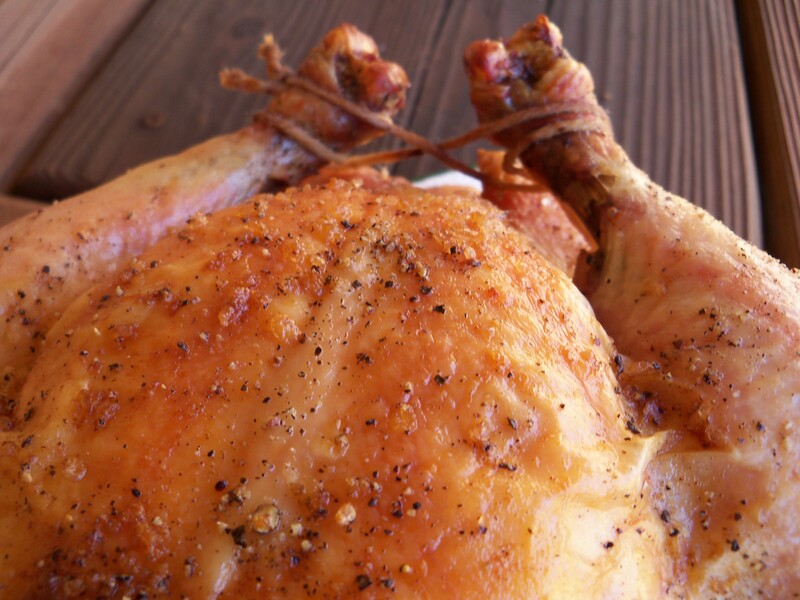 I find the simple roast chicken recipes to be really delicious. It’s the gravy that always seem to bring the roast to life! That’s your Rosemary bush???!!! It’s huge. I took a hand at growing it last year and it was 3 little stems. I’m doing something wrong. Speaking of..is it wrong if I just wanted to place my mouth on that chicken as if I were a dog and eat? Just sayin’, that looks so good. Oooh, what I’d give for that rosemary bush! I’ll bet it perfumes the whole area. I always have a bunch in my fridge. The song title sounds familiar … must be one of those things mum used to sing to herself when pottering about the house. This is certainly one of the classic dishes ever! It’s awesome that you’ve got the herb just at your backyard :) Thumbs-up! My dear, I’ve been nominated for this Int’l Women’s Day. Appreciate if you could support this event & click on “Like” @ Support International Women’s Day! Thks, dear! Shary, I do the same thing. It lingers on the fingers, so to speak! I love that aroma. Lovely chicken! I bet the smell was pure heaven! YUMMY! Have a wonderful day and weekend! Only today did I speak with two different women friends about herbs, and both had very different opinions of rosemary. One HATED IT! I acknowledged that it can be overpowering. The other appreciated it when wielded properly. I am in the latter category. Your chiLcken looks so savory and comforting; wonderful pics, Kimby. Thank you, Sid! I agree with you — a little rosemary goes a long way. But oh what a delicious difference it makes! Rosemary and chicken are such good friends! …and it’s one of my fav-o-rite herbs! I hope you are well. Rosemary can make any dish yummier. I am going to have to try this. I have never heard that song…sounds interesting. Christy, I believe that song was popular before you were born. :) My “herb garden” consists of a one-hit wonder, too — the rosemary plant is the only inhabitant so far. But I’m planting basil, oregano, cilantro, sage, dill, parsley… a symphony of flavors! This roast chicken looks YUMMY! I adore rosemary too.. Should I feel bad that I have never heard that song before? I will go check it out now… and your recipe too! I am going to make that soon… Believe me!